Solyndra plans to go public and raise up to $300 million, the company said Friday. The high-profile solar company didn't specify how many shares or at what price for its stock offering, according to its filing with the U.S. Securities and Exchange Commission. Fremont, Calif.-based Solyndra has garnered lots of spotlight for its technology and for winning a $535 million federal loan to build its second factory complex near its headquarters. The groundbreaking ceremony for the factory project in September this year was a big publicity event that drew Energy Secretary Steve Chu and California Gov. Arnold Schwarzenegger (and a speech by Joe Biden that was broadcast via satellite). The IPO will be closely watched, and the degree of its success would pave the way for other thin-film companies that want to go public in the next year. Thin-film solar developers use little or no silicon in their cells, an approach to reduce manufacturing costs. Solyndra uses copper, indium, gallium and selenium as key ingredients in the solar cells, and getting them to work well is a big challenge. But CIGS cells could do a better job of converting sunlight into electricity than other materials being used, such as cadmium-telluride and amorphous-silicon. Most of the silicon cells in the panels today use crystalline silicon, which has historically been much more expensive. Solyndra has announced more than $2 billion in sales deals in the United States and Europe. The announcements have painted an impressive picture of the company, which began commercial shipment in July 2008. Solyndra sold 17.2 megawatts of panels from Jan. 1 to Oct. 3 of this year, the company said in the SEC filing. It sold 1.6 megawatts last year. Solyndra posted $58.8 million in revenue and posted $119.8 million in net loss for the first nine months of this fiscal year (ending Oct. 3 2009), the company said in the SEC filing. It generated $6 million in revenue and posted $232.1 million in net loss in the previous fiscal year that ended on Jan. 3, 2009. Its customers include Alwitra, Carlisle Syntec Phoenix Solar, Geckologic, Solar Power Inc. and Sun Systems. Solyndra said it has agreements in place for delivering up to 865 megawatts of solar energy systems (panels and racks) by the end of 2013. The company's existing factory is running at an annual production rate of 45 megawatts, and it plans to expand that to 110 megawatts by the end of the next fiscal year, according to its SEC filing. The second factory complex, which is under construction, would first have the annual production rate of 250 megawatts by the first half of 2012. The $535 million federal loan would pay for this, first phase of the factory project. The second and final phase would add another 250 megawatts and cost another $642 million. Solyndra plans to use proceeds from the IPO to help pay for phase 2. Solyndra said it also has applied for a federal loan guarantee of $469 million to help finance phase 2. There have been a paucity of solar or even greentech IPOs in the U.S. market in the past year. The fist solar company to do in more than year was Specialized Technology Resources (STR), a Connecticut maker of encapsulants for protecting solar cells in panels. STR (NYSE: STRI) went public in November, but didn't see a spectacular reception for its stock. The shares closed up 31 percent on the first day of trading, and haven't moved much since. The stock closed at $13.71 per share Friday, up 1.78 percent. Another solar company, Trony Solar, was supposed to debut on the New York Stock Exchange last week. But the Chinese developer of amorphous silicon solar panels postponed its IPO, citing unfavorable market conditions. Neither company stands out like Solyndra does, however. Founded in 2005, Solyndra has developed solar panels that look unlike most of the panels on the market today. Instead of having a flat surface of a conventional solar panel, Solyndra's involves a series of solar-cell filled tubes lying side by side inside an aluminum frame. The cylindrical design enables solar cells to capture diffused and reflected light, the company said. 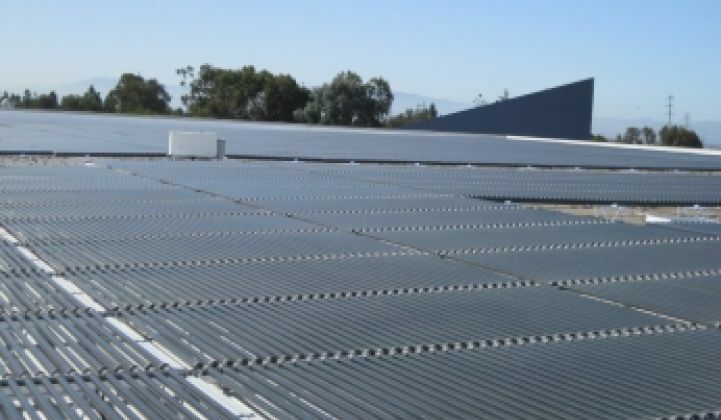 Solyndra, which also has designed a low-profile rack to hold the panels, is targeting the commercial rooftop market. The panel-and-rack design shaves labor time and costs, the company said, a claim that has drawn skepticism from competitors and analysts. Few thin-film companies worldwide are public companies. But Solyndra wouldn't be the first CIGS developer to go public. Ascent Solar Technologies (NSDAQ: ASTI) in Thornton, Colo., went public in 2006 and is putting CIGS thin films on plastic. The largest thin-film company in the world is First Solar, based in Tempe, Ariz. First Solar (NSDAQ: FSLR) makes cadmium-telluride solar panels.